Today, we become ice cream activists. This is a call to arms, a grassroots movement. The Mission: Convince the Baltimore Orioles to offer Ice Cream Helmets. The Plan: Get as many people as possible to email the Orioles to request Ice Cream Helmets at Camden Yards in 2010. To do so, click here, here or here. Oriole Park at Camden Yards is a true jewel of MLB. If you have never been there, you are missing out. It is a must see experience. So book your trip now. But the good people of Camden Yards have gone without ice cream helmets long enough. These are good and honest people, fans of the game of baseball. But they just ate a delicious BBQ sandwich at Boog’s BBQ with a side of baked beans, and now they need dessert. It is an extremely hot summer night with 85% humidity. Only ice cream will do the trick. This is where things go horribly wrong. There are no ice cream helmets to be found. Not one in the entire stadium. 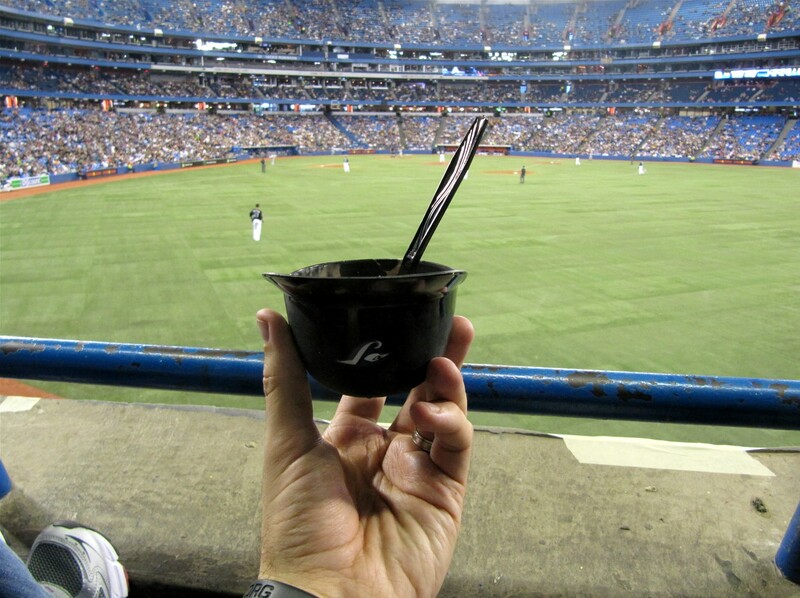 Fans are forced to buy ice cream on a popsicle stick, or in a plastic bowl or a stryrofoam cup. These alternatives give temporary relief inasmuch as ice cream is delivered. But then it is gone, and the bowls and wrappers become garbage cluttering our landfills. Plus, there is no souvenir to take home to remember your day at the ballpark. We brought our own Mariners ice cream helmet to our final game of 2009. Tim can’t get enough of it. But look, there is more. Look how happy the lady behind Tim is to see Tim enjoying ice cream the way it should be enjoyed at the ballpark? Why Ice Cream Helmets, you ask? Did you know that when we brought our Mariners ice cream helmet and had it filled at Camden Yards, they made us take a styrofoam cup, just to be thrown away. They needed it to be gone so they could keep track of inventory. Sorry, mother earth. Second, not only are they collectibles on their own, they also provide an excellent canvas for the autograph of your favorite player, as shown by MLBlog’s Howie on his blog (scroll down for a picture of an autographed Mets ice cream helmet). Tim and I have been to 18 stadiums (16 teams when you factor in that we have been to both Shea Stadium/Citi Field, and Old/New Yankee Stadium), and we have ice cream helmets from all but Camden Yards. Fourth, they are handy to have around. Tim eats something (crackers, cereal, you name it) out of an ice cream helmet almost every single day. Thank you for contacting the Orioles. We appreciate your suggestion, and I have forwarded your message along to Aramark, our concessionaire. Will Camden Yards have ice cream helmets in 2010? Camden Yards is still the only stadium of 18 visited where we have been unable to get an ice cream helmet. Let’s fix this problem in 2010! By the way, I know a guy who got an Orioles ice cream helmet at the ballpark in Arlington in 2009! Don’t let Texas be the only place that offers Orioles ice cream helmets! That brings up a good point, did you realize that in 2009, you could get an Orioles’ ice cream helmet at Rangers Ballpark in Arlington. Check it out on Brian Powell’s blog. So, the plan? I’d like to invite as many people as possible to join with us in letting the Orioles know that the public wants ice cream helmets at Camden Yards! You can do so by clicking here, here or here. If you are interested in joining the cause, we have a couple suggestions. If you’re from the Baltimore area and frequent Camden Yards, let the Orioles know you are a fan and think ice cream helmets would help enhance the already great baseball experience that Camden Yards provides. If you are from elsewhere, let them know where you are from and let them know if your home team has ice cream helmets. I don’t know if it is the case, but if it is I’d love to let the Orioles know they are the only team who does not offer ice cream helmets to their fans. Where else? Please help out. Send an email to the Orioles. I also invite you to leave a comment here identifying your home MLB park and if they offer ice cream helmets. A couple more comments before we close, we know that Orioles ice cream helmets exist. A google search showed us that they exist — see here. And, we know that people are interested. Specifically, we track our blog stats through www.statcounter.com. Statcounter shows what people searched on google, bing, etc. to get to Cook & Son Bats’ Blog. Just this morning, Statcounter showed that someone search google for “orioles helmet ice cream.” In fact, not a day goes by without someone landing on our Ice Cream Helmet collection entry, and a portion of those people have been looking for Baltimore Orioles Ice Cream Helmets. So have we. Hopefully we find them at Camden Yards in 2010. Please help us in this effort. We will be attending a game at Camden Yards in early April 2010. We will report back then (and periodically if required) regarding whether this movement has had any affect in Baltimore. Done and done! I hope they get ’em there soon for you guys! Great Post. Inventory is killing our planet…fantastic. Have you been to Pac Bell/SBC/ AT&T Park before? If not I could give a few pointers of where to go before the game for some good brew and grub (Kid Friendly!). Great entry! Thanks for the mentions too by the way. I’m on board with your campaign, being one of a very few people in the country with a Baltimore ice cream helmet, I fully agree with your arguement. I’ll send as many letters/emails as you want. Hopefully the BiA keeps the helmets going this year too, because I still need a few more to have the whole league. > We brought our own Mariners ice cream helmet to our final game of 2009. This is a very good idea. I like it! Plastic helmets we see here look mechanically stable and are likely to serve as reusable food containers. Cash-back for the container cost offered to consumers bringing their own ice cream helmet to the ice cream vendor would contribute to reduction of wastes from sports staduims. Handing a cash-back coupon indicating the amount to be refunded would be practical. Todd not only do the Angels have ice cream hemets, they also have french fry helmets that are about 3 times the size. When i went to Oakland over the summer, I was amazed. They have 3 sizes! They have ice cream, french fry, and chicken strip meal sizes!!!! What…no Dodger ice cream helmet??? This summer will be my first time to AT&T Park. Any pointers would be greatly appreciated! Actually, I have not been to S.F. at all since 1993, when we rolled through on our way to L.A. We drove out to Candlestick having no idea of the Giants had a game that day. They did not. But I convinced a worker to let us go inside to see the stadium. It was awesome. He took us right out on the grass in RF and let me and my buddy test our homerun pick off skills on the RF wall. A great memory. I knew I could count on your support! Thanks. Hopefully we’ll get some Orioles helmets to match the one you already got at BiA. That’s a great idea! Everyone wins! Thanks. Awesome! Thanks for the helmet info! I can’t wait to collect those helmets. I love our Brewers cheese fries helmet. It is perfect to use as a cereal bowl, among other things. Not yet. But if they have ’em, we’ll definitely be picking some up this summer at Chavez Ravine. They definitely have Dodger ice cream helmets and great ice cream or frozen yogurt. Excellent! We’ll be picking up some Dodgers ice cream helmets this summer! WOW – I’m jealous! I really want to go to Busch in St. Louis. maybe next season. Your trip sounds awesome. I’ll let you know soon if we’ll be in Baltimore when you are coming through. By far, I am not an expert on amusement parks. But I know of two fairly famous parks in PA: Dorney Park in Allentown, PA (north of Philadelphia) and Kennywood (in the Pittsburgh area). I think Dorney Park is pretty modern with lots of scary looking rides. Kennywood is listed as a historical place. It is very famous among rollercoaster people. It is also featured in the movie Adventureland. Wow, I love the photos of the helmets and the balls. Good luck with this. Thanks for your interest in cash-back coupon. I believe this will not only encourage reuse of ice cream helmet but also facilitate inventory. Count the number of coupons waiting in the stock box just like counting unused styrofoam cups. A serial number or barcode printed on each coupon would further facilitate this process. Either papar cards or adhesive labels might be used as coupons. I’d prefer adhesive labels that can be attached to the surface of helmets. Thanks. And thanks. 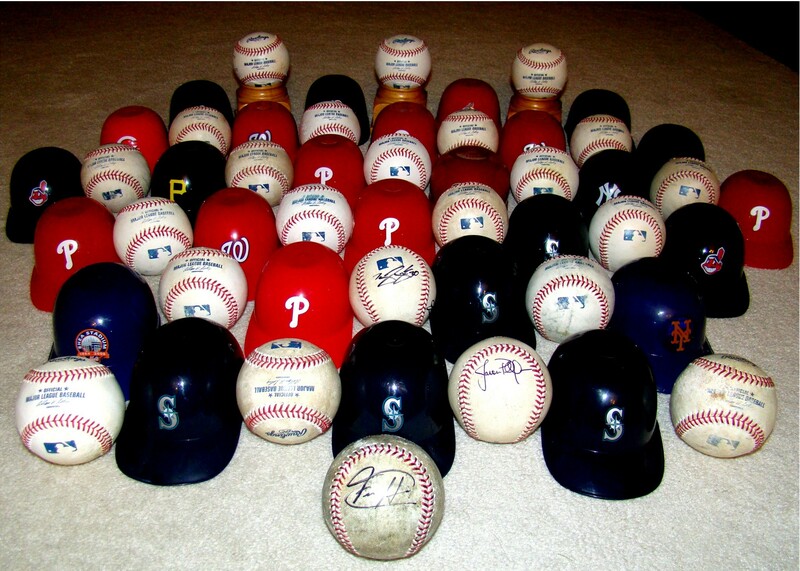 The bigger picture was taken last July and includes all of Tim’s baseballs to that date. The balls on the displays in the back are Tim’s 1st, 3nd and 4th baseballs (we gave his 2nd to a cousin who was with us at that game). Thanks for your help. Its much appreciated. If only I ran all of the stadiums, I could implement this idea. But who knows, maybe the Orioles will actually read this entry, they’ll get ice cream helmets, and then implement your plan. Wouldn’t that be cool!? Thanks for letting me know about Coors Field. I’ve added it to the list. No need to send a helmet. The goal is to get one at each stadiums the good old fashioned way – filled with chocolate ice cream and topped with sprinkles. I don’t know where you’ve been looking, but Baltimore definitely has, or used to have frozen yogurt in the little baseball helmets. I had season tickets there for years and used to get it frequently (and have quite a few helmets in a box somewhere). The last time I was craving some was 3-4 years ago and they still had the helmets. Hey, I hope I am just missing them. But I don’t believe so. I have discussed it multiple times with the people in the Orioles Fan Assistance Office. Those people are extremely friendly and helpful. They have walked around with me looking for ice cream helmets. Ultimately, they told me they don’t have them anymore. That has been the story as far as I know it since 2008. Plus, I think if the Fan Assistance people and I were just missing them, the email above would have simpy told me where to find them. But let’s hope they reappear in 2010! This is an atrocity! No ice cream helmets! I have an assortment from Dodger Stadium. Blue, white and in two different sizes. BTW, the picture of the helmets and the baseball is beautiful! I am signing up so the folks at the stadium can correct this. I use mines to serve ice cream at home. The Orioles are pleased to have ice cream helmets available at Camden Yards this season, sponsored by Carvel. They can be found at Carvel stands located around the ballpark. We look forward to seeing you at the Yard! Funny I come across your post now! 🙂 I visited Camden Yards for the first time last season (loved it and def want to go back) and was so disappointed to have to leave early to catch a train home and not find an ice cream helmet! I feel a tiny bit better knowing they didn’t exist – I had a hard enough time trying to find a collecter’s cup! Yes I admit it – I have a collecting problem!!! Thanks for the update and your hard work in getting the O’s on board w/ the helmets – now I have another excuse to head back that way!!! need to research what plants bloom during whichh seasons. Stained, yellow and discolored teeth make yyou feel embarrassed. age 65 and older that is federally and state funded. I don’t realize who you are however certainly you’re going to a well-known blogger should you are not already. The sniper should get them with the chances related to them getting our sniper are special to zero. A idea that any person definitely want returning to consider is relying on an ebay sniper.